Week thirteen in London. A new year. New friends. A new place to live. A new bedroom (thankfully with a window this time). New housemates. I should be excited, right? Unfortunately much of the excitement and optimism that wrapped my first blog post has disappeared with the decent weather. Although London life fits me like a glove - there is one department that has left a lot to be desired. 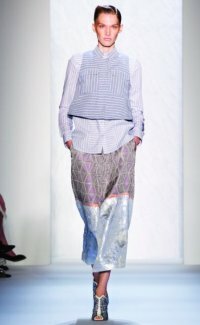 Where are these new ethical and sustainable designers I had been so excited about discovering? This week’s mission was to write a fashion-focused blog post. Easy. I decided I'd focus on a selection of designers and make only the briefest of mentions of each designers' commitment to be more socially or environmentally aware. Because at the end of the day these designers are just as creative, interesting and innovative as other high end designers. So why not focus on that, rather than their 'green credentials' - and just see these social / planet helping qualities as an added bonus to their already noteworthy designs. After combing the Internet for hours, I came out with a very small list of designers I wanted to focus on (including MaxJenny, right). Suddenly my argument didn't seem so valid. Many of the designers I came across, who claimed to be 'sustainable,' 'ethical,' 'fair trade' or 'organic' were nowhere near as fashion forward as I had anticipated - falling very short of my expectations and their high end or high street competitors. Too often I found unpolished websites, poor illustrations, dated styling and amateur photography. This may sound very critical, but it must be said if we want to make a change to today’s fashion culture. What I hope for, and believe in, is a fashion industry in which clothing is produced as sustainably and ethically as possible. Always. It won't be about a small group of designers waving their green flags in the air to say 'look at me, I am a sustainable designer!' All designers will be doing it - it will be their obligation as a contemporary designer. In this future we would look back at the past and grimace at the thought that once upon a time fast fashion existed, that designers didn't think it was their responsibility to care about the environment and that some companies produced clothing in sweat shops (the phrase 'sweat shop' would have to be looked up in a dictionary, as no one would even know what one was anymore). The reality may feel like it's light years away, especially when we see the hoards of shoppers stampeding for the fast fashion retailers on Oxford Street and lining up to look at handbags in the Boxing Day sales, but we must remain optimistic. Take it one step a time. I think the first and most important step of this journey is for 'sustainable designers' to design beautiful clothes that people want to buy. Not because it is made ethically. Not because it's made from organic fabric. Not because it was made locally. Not because it's fair trade. But because it looks good. It is so well designed, well made, innovative, creative and timeless that it just begs to be bought. And then the fact that it is made from a sustainable fabric or supports a local community is just part of the package. If we want a sustainable future for fashion, these ethical brands need to be as shiny and polished (their designs, styling, branding, marketing and websites) as their high end counterparts. The unassuming buyer won't even know that they are buying something that is better for the world. This is not about encouraging a sustainable fashion crusade. It is about sustainable designers cutting their way into the market and their clothes being purchased because at the end of the day, their designs are the best. I was instantly taken by the 'Honest by' platform, whose website, photography and styling is clean, sharp and sophisticated. The site provides an opportunity for both new and established designers to sell their pieces or collections. Their philosophy is to not only showcase designers who are using the most environmentally friendly fabrics and techniques available, but to also be totally transparent about their materials, production and costs. If the story behind every garment we purchase was this transparent, we would begin to appreciate how much time and work went into a particular piece, and I'm sure many of us would make different choices. Most of us would steer clear of the shoes that cost £150 retail, when we discover the person who made them only received £3 for their handwork. Kami Organic (right and main header image) produces fashion that is innovative, cutting edge and Eco-conscious, three words I found often cannot be put together in a sentence. Their website and styling is as cutting edge as their collections. Kami source the most eco friendly fabric, production techniques and technology they can for each piece they design, and their pieces are strong, bold and very modern. Danish designer MaxJenny (above right) uses polyester made from PET bottles to create bright, geometric ponchos and jackets. The brand specialises in active wear that is innovative, functional and very wearable, and through interesting pattern cutting, minimises fabric waste. The brands philosophy is to create versatile garments that fit all women and all lifestyles, for their whole life. MaxJenny’s website and photography is bold, fun and colourful, just like their designs. New York based designer SUNO creates beautiful, feminine fashion, which is whimsical, and enchanting. Their strong colourful prints are contrasted and highlighted by bravely and very successfully layering print on print, which is reinforced by their quirky, yet sharp, styling. Co-founder Max Osterweis’s vision’s to encourage long-lasting social change: his initial aim was to produce in Kenya, utilising and nurturing the skills of local artisans, thereby stimulating the Kenyan economy. Suno now also produce their collections in workshops in Peru and India, as well as in its home base – New York.